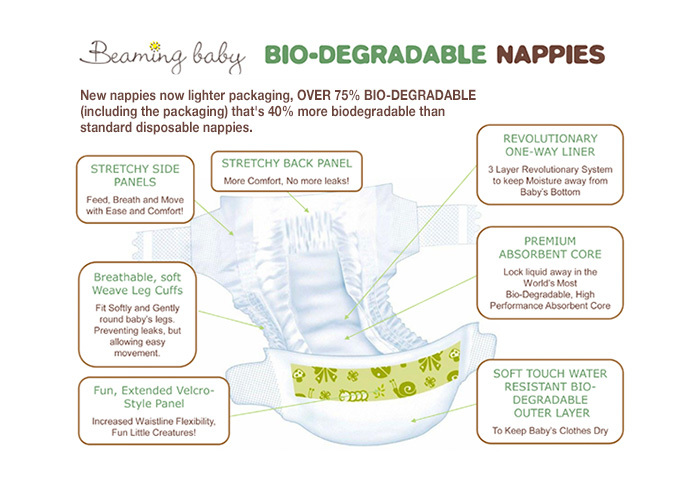 Beaming Baby Bio-degradable Nappies MAXI (34) Size 3 biodegrades within 4 years instead of the MIND BLOWING 400 years that standard nappies take! Making the world a cleaner and better place for your baby to grow up! Beaming Baby Biodegradable Nappies are 30% less chemicals than standard nappies, 21% less than other eco-disposables and are fragrance free. The packaging is also bio-degradable to further reduce the impact on the environment. They have a biodegradable water resistant outer sheet made with natural cotton and cornstarch paper. They are totally chlorine, Ylang Ylang & Chamomile (fragrances) free and contain only clean plastics which are used in the velcro patch and elasticated back and side panels. 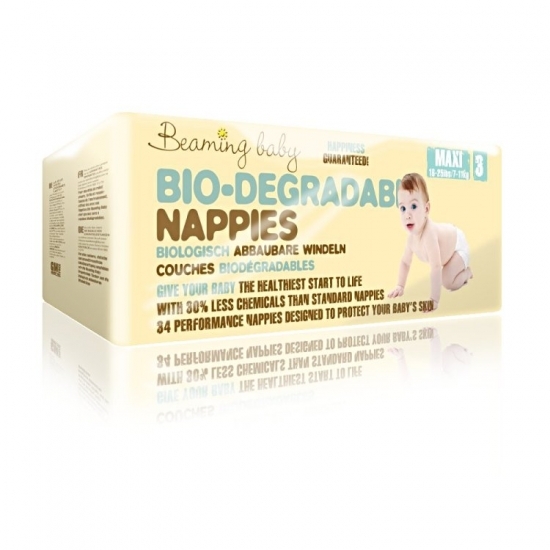 Beaming Baby Biodegradable Nappies not only have RADICALLY reduced chemicals in these nappies, but they also have introduced a REVOLUTIONARY Naturally Breathable Layer against your baby's skin. Combined with a TOTALLY GM FREE Absorbent Core to keep the wetness away from your baby's bottom for up to 12 hours. PROTECT and SOOTH sensitive skin. Giving your baby the perfect solution for NATURALLY HEALTHY skin. Made with natural cotton and cornstarch paper. OVER 75% BIO-DEGRADABLE (including the packaging) that's 40% more biodegradable than standard disposable nappies; this is the most biodegradable disposable nappy currently available in the Singapore. Beaming baby was set up to provide a choice of natural baby products as pure and organic as possible, and they would not contain any chemicals, colours or perfumes to the consumer. Established in 2000 it has gone on to become a leading baby care retailer offering products including disposable nappies, organic wipes and organic cream in UK.